Spinsters and Lunatics: Secret Identity - now with a cover! Secret Identity - now with a cover! I've been a bit out of pocket for the last three weeks, dealing with a bad case of cellulitis in my left leg. I'm still not back at my day job (though I'm working it from home), and I've been doing a lot of extracurricular napping to regain my energy. All that to say, I've been a complete slug at the whole blogging/social media thing. 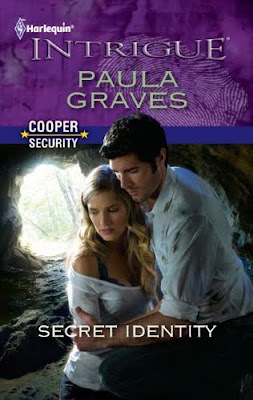 But I do have something to share: the cover of my March 2012 book, Secret Identity! Wanna see it? I'm pretty pleased with the cover. The hero and heroine look about how I pictured them, and the cave they're in is mostly right (though there's entirely too much light coming through the entrance). I really love this heroine. She's tough, prickly, wounded and dangerous. I hope y'all love her, too. Love the cover except if they are trying to hide in that cave it would entirely too easy for the bad guys to find them with the wide opening and all the light. But I will be looking forward to the story!!! Can't wait. Love the cover.